For Christmas, Natalie was given a copy of "The Big Green Book of Beginner Books", a collection of stories by the famous Dr Seuss, writing under his pen name of Theo LeSieg. While she likes all of the stories in it, one has stood out from the beginning as her favorite - so much so that I have it pretty much memorized, we read it so often! She even takes the book to bed with her every night, refusing to go lie down until she has her "duck feet" story with her. 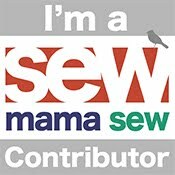 I used that story as my spin-off for my I Love to Read month challenge, from the Scientific Seamstress. "I Wish That I Had Duck Feet"
Just the cuteness all around. what a great idea.